Expat Mum: Britain - A Nation of Selfish Parkers? Britain - A Nation of Selfish Parkers? One of the lovely things about returning to the UK as a driver is the frequency with which other drivers let me in, out and through. In my particular part of the USA, to signal an intention to change lanes on the motorway/freeway was, for the most part, a cue for other drivers to bunch up as tightly as possible to prevent said lane change. Similarly, when wishing to turn out of a side street onto a main road, it was safe to assume that no car would ever let me out until it could go no further itself. Then, when a red light meant cars were in effect stuck, I was allowed to squeeze out between them. (I realize that this is a regional issue, by the way.) In the UK, all I have to do it seems, is turn my indicator on and a gap appears in the desired motorway lane, often accompanied by a flash of headlights. One thing that does not impress me much is the parking. As I mentioned recently, it’s one thing getting used to cars parked on the wrong side of the road, (which still gives me a slight moment of panic five months down the line), but quite another seeing cars dumped anywhere and everywhere. Seriously people, there are lines to help you figure out where to put your car you know. It might not seem much of a big deal to straddle that line if there are no cars around, but as the car park fills up, your straddling means that everyone else has to straddle and at some point there will be several parking spaces wasted. And that’s usually when I turn up looking for one. Grrr. Then there’s parking on the pavement. I understand that many roads and streets in the UK were not built for cars so it’s all a bit tight. They were however, built for people, and pavement parking makes it very difficult for some people to use them. Leaving ten inches between your car and a hedge or garden wall results in blocked access for wheelchair users and pram pushers. 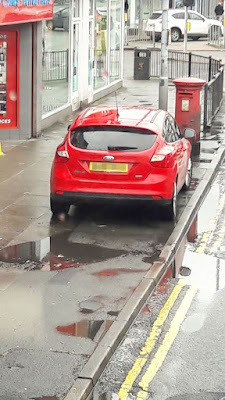 Clearly the plight of such people isn’t enough to make these prattish parkers think twice, so local councils up and down the country are about to be given more powers to ban such selfish parking and mete out harsher penalties. You are warned! Meanwhile, it seems those of us not parking selfishly are hopping mad at those who do. There are groups and web sites popping up everywhere to help shame these reprobates. The folks at SelfishParker.com currently have over four thousand photos of poor parkers, and over fifteen hundred members. Being the admitted geeks they are, they have broken down their finds into some interesting statistics too. A whopping 34% of cars posted have their own personalized number plate. Hmmm. If you're one of the many who've had enough of selfish parkers, you can print off this flyer and ram it under the wiper of the next offending car you encounter. And don't forget to upload a photo to the web site. Larry David has a wonderful Curbed episode about the guy who parks on or over the line. I think I remember that. Hope I'm not coming across as neurotic as Larry David though! From day one, up to this current day, the way the Brits park astounds me. I think it mostly comes from being a small country with too many people and too many cars. On the other hand, I always manage to put my car into a reasonable parking spot so I'm not sure why other people need to abandon their cars in the street. In related news, it has become increasingly popular to park in residential neighborhoods close to the airport when you are jaunting off on a two-week holiday, thereby using up the limited parking space available to residents. I understand that these fly-parkers are now coming home to find their cars vandalized. I cannot condone violence, but I understand their frustration. Yes, I saw that. Simple remedy though, would be to make it permit parking only. They do that all over the place. Then they can tow the cars and recoup the cost with the fine.